Like the design of this desk, the adjustable feature and sturdy material. I bought this desk for my little 5 years daughter. She loves studying using this desk. The desk is with high quality, and convenient. Worth buying one for kids. We love our Moll desk. The quality and design of the Champion desk is superb. 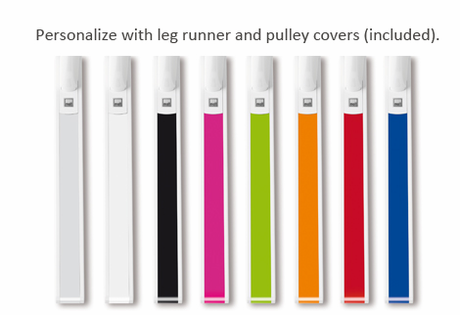 The height adjustable feature is very convenient. This is a high quality product designed for kids. Both my daughter and son love it and have enjoyed using it every day since we bought this desk. The material and build is high quality. Currently my kids are sharing this desk. If we need one more kid desk, we will buy from Moll Desks again! We bought this desk for our grandson in Jan 2017. He loves it and enjoys sitting and working on it. It is still in great shape but the left side no longer lifts up. I guess this happens over time. This desk is certainly not cheap but if you can spring for it, it is a very worthwhile investment. Build quality is superb and Bindertek is high responsive to address even the most minor imperfections. The relationship you have with Bindertek post purchase is more like buying a car than a desk. They support the product through it's lifecycle. The desk is highly functional, easy to assemble (although it does take more than 20 minutes), and my daughter loves it. 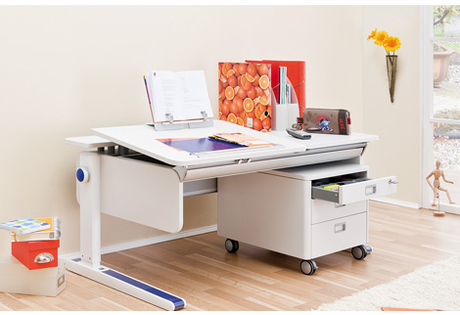 High quality, convenient uses, and super steady desk. I highly recommend this one for you. Thanks for making this wonderful product. No doubt this is the best desk your money can buy! Worth every penny because it is an investment piece of furniture that will last for your child(ren)'s educational years. It is sturdy but sleek, solid in quality, easy to assemble and use, practical in design, and functional for all ages. My 7 yrs old son loves it. Will be buying another one for his little brother.It is high quality and will last long time.Everyone who sees it says WOW what a desk. It is so cute and functional. Easy installation. You get what you pay for. 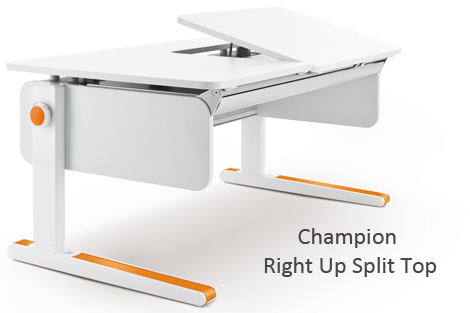 We have been using the Moll Champion Adjustable desk (left up style) for the past 2 years. My daughter loves sitting at her desk to work on homework, read books, doodle, and do arts &amp; crafts. It is the focal point in the room, where she spends the most time in her room. The flexibility to tilt the desk based on the task is very useful, especially since my daughter can do it on her own. The desk is also very well built and the 'left up' layout is great to have stationary lying on the desk for a right-handed person. Back compartment is also useful with lots of space. Currently, we have put a multi-tab outlet so that we can put an Amazon Echo (used by my daughter as an alarm, dictionary, music player, and daily weather informant) on the top part of the desk. No complaints so far on the desk although it was a pretty big investment upfront. Our son has also been eyeing our daughter's desk for sometime, so we will be purchasing another for our home once he is ready for kindergarten. In summary, I would highly recommend if you are looking for a quality desk that will last for many years. We bought this desk a few years ago for our son (7 years old at time of purchase), knowing he'd get many years of use out of it. We also bought the giant drawer to give him extra storage. He really loves this desk and now that the homework is picking up, he has a nice large space to work on. He also uses the tilt top when he draws. Just the other day, we noticed the height had become a bit low for him due to his growth, and we were reminded of our wise investment as we raised the height of the desk. The adjustment tool is a little awkward, but it's only something we'll have to do every year or two. great desk with easy to adjust heights. very sturdy for boys. It came quickly. Easy to put together. My daughter loves it. You can change the angle of the desk and adjust the height. No complains so far. This desk that encourage my child to stay in place while she does her homework in comfort. I have one 6yrs old who has been officially enrolled in 1st grade. Sitting down and doing homework has been a daily task for him, after doing a lot of research I decided to buy a moll desk for him. It is well designed for kids to use ,my son loves his new desk. I'm going to buy the second one for my daughter as soon as she can start writing. We already have two of the desks at our home and my boys love to work or just read while sitting at the desk. For me especially the quality and adjustability was a reason to buy the moll desk because I like that the desk enables my kids to maintain a healthy sitting position while they are growing. 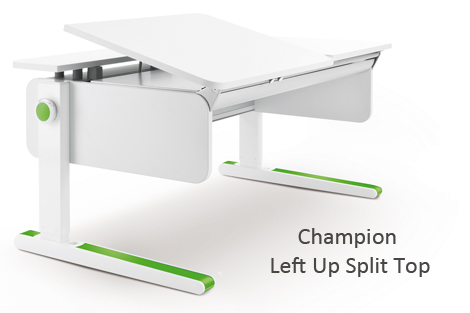 What I also like a lot about the idea behind the Champion desk is that I can extend parts as they become necessary. And for my sons, it is a hugh winner that they can change the colors of the desk and do so every year. The desk isn't cheap but in my opinion very much worth the money because the desk is reliable, and &quot;grows&quot; with the kid so that I hope we can skip some back issues which can result from a wrong sitting position, since the kids spend quite some time each day at the desk. Since my kids are all still quite young right now I find them all often in a standing position around the table to do some joint projects which I also like. They can adjust the hight easily all by them self. So overall, we love the desk and can highly recommend it. I was just looking for the right size desk for my kid. This is it! We can adjust all the height and my son can use it until high school. Price is bit high but it is worth it! I had to persuade my husband why I had to spend more than a thousand dollar to buy a kid desk for months. Once we put together and see our 6 yr old son sit on the desk to do his homework and art project, my husband said itls Worth It. My son loves blue and he loves his blue moll desk! I bought the Champion desk about a year ago for my son, who was 7 at the time. He is short for his age and I was looking for a desk that would fit his needs. I was curious about the flexibility of the Moll desk and this is what drew me to it. I'm very pleased with my purchase. In addition to the adjustability, there are two other features that I appreciate: (i) it is very easy to assemble, and (ii) it is very well thought of (design-wise) and uses very good materials for its construction. After a year of intensive use the desk still looks like new. In terms of areas for improvement, I would say that the mechanism to tilt the desk looks a bit less sturdy than the other parts. To have a string connected to a button in the front of the desk makes it very tempting for a child to &quot;play&quot; with it. I would suggest to make it less easy for a young child to adjust the tilt. This is in the end a very minor point and I have no regrets about my purchase. It is an expensive desk but one that will last for many years, has a classic modern design that will not go outdated. The return on investment is high. To complement my review, I asked my son for his own views. He said he likes that the desk has a lot of room. The only improvement he recommends is to add a built-in screen! I hope Moll does not follow on this last recommendation. So we searched high and low to get a desk for our daughters room. We wanted something that will grow with her, and was well constructed as to last over the years. Moll Desk provides us will all these options and looks aesthetically pleasing for adults and fun to use for kids. So expensive yes, but you get what you pay for. We bought the Champion adjustable desk about one year ago when my son was 4 years old. We did lot of research on the adjustable desks. The Moll Champion adjustable desk is the most expensive, but we think it is worth of money as my son loves it. He likes to do art work, drawing and reading at the desk. As he is growing, we can easily adjust the height of the desk. The quality of the material is definitely the best, compared against other brands. We bought the Moll champion desk and chair for our 7-yr old daughter. We love it! The quality and color are great. Highly recommend if you are looking for a high end and ergonomic product for your child! Bought this desk for my 8 year old son, he loves it. Maybe I should buy one for myself. Thus desk is all you need for your kid. With excellent terminations and quality materials, it is a desk that your kid will enjoy for a lifetime. The mechanism works smoothly and the drawer is very wide. No need for another desk once you get this! This desk is perfect for my son. We got it when he was 5 years old and now he is 7. The desk is a good size with plenty of room for him to spread out his books and paper. It is very easy to adjust . I bought our first champion desk for my 6 year son around two years first. Moll champion is a perfect choice for school-age kid. Easily adjustable as kids grow. And most important part is kids love this desk. The purchasing process was also very smooth. Very high quality package and easy instructions to put it together. We are very satisfied with the choice and we bought second one for my daughter as well! The quality of the desk blows away all other desk I had for my son and the available desks I have checked on market. It took half hour to assemble. It is just both beautiful and easy to use, my 5 years old son likes it a lot, and we believe it could be used till he is ready for college. love the desk... my son loves it as well. It is very nice. We love it! I would recommend this desk. I did so much research to find a perfect desk for my son. We love it. High quality. I have another son who is 1.5 years old, I will purchase another for him when he grows up. Excellent quality. Good value considering you only need one desk for years. My only regret is purchasing the Moll Champion Desk when my son turned 12 yrs old. He could have benefitted from having this absolutely awesome unit years ago but I only learned about it now after seeking for a desk that was ergonomic and well built. Your child will thank you as he/she realizes the desk height is always right, the top shelf depth is within reach, and it sits solidly on the surface with zero rocking. My boy is starting high school next year but he tells me this desk is going with him to college! :) My best buy of the year or as my son tells me, ever! We bought this desk for our 7 year-old son after a strong recommendation from my sister-in-law who had purchased the desk for her son. It was very easy to assemble since the instructions were very simple yet thorough. The desk is very pretty with it's simple colors and very comfortable to use. It is height-adjustable (very easy to operate) so that my son will be able to use this for many years. He likes the desk very much. I am very happy with the product and recommend it to anyone. My oldest son who is 15 years old grew up using this desk so I decided to buy the same desk for my younger son. Very good quality and very good for the posture. I am highly recommending it. This desk has a lot of work space and super big drawer that meets my need. 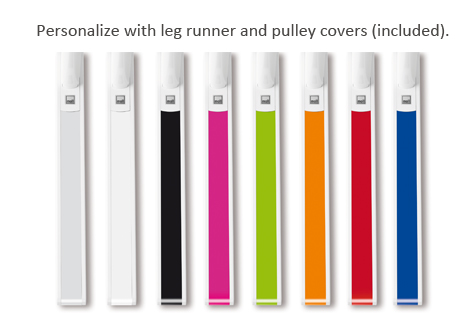 The design is really nice and you can change to different colors that in the package to match the theme in the room. It is expensive for a desk but you got what you paid for it. I am thinking to get the different and cheaper desk model &quot; joker&quot; for my other child and hope is as good as champion. The best desk. I have three at my house. One for my son who is twelve, bought it when he was 9, and one for my daughter, one for my husband and myself. My daughter had chronic neck problem due to studying on old desk. 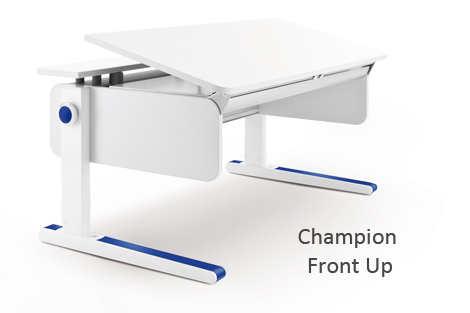 Once we got Moll Champion adjustable desk, she no longer complains about the neck pain. Also bought Moll chair. Very happy with both products. I ordered this for my 6-year old grandson last year and he loves sitting at it every day! The quality of this desk is beyond reproach. Perfect for doing school work, typing on a laptop, art drawing, or working on small crafts projects. It has an easy to clean and very stain resistant surface. The adjustable angle and height allows this desk to adapt to any task at hand, and what's better, it grows along with the child into adulthood. Highly recommended! I bought champion desk and chair with lamp from Moll half a year ago for my kid. The set is a perfect choice for school-age kids. The quality is stable,the design is scientific. Plus, it's easy to assemble, easy to clear. Anyway,I am very satisfied with the choice! We have purchased the desk for our 6 year old son and we are very satisfied with the product. It is stylish, well made, adjustable to the needed height and also functional. I was very impressed with the quality of materials, the sturdy construction, outstanding comfort and integrity of design. Our son loves it. What a great investment and excellent product! Definitely recommend! I think it was the best decision I made to buy this desk for my son. He is 7 now. Though he uses it only for his art and homework but i use it more for all my work. I do my paperwork and lot of my pencil art on this. Its very spacious, comfortable and the best feature is the tilt. The only improvement I would look for is in the chair because I have back problem and the chair is not very comfortable for me. My son keeps swiveling on it. I think kids need more of stationary chair but again thats just my son. May be some kids will really like it. Overall the most awesome desk I could get for long term use for us as a family. Bought the entire package with this desk for my 10 year-old daughter. I've done detailed research on all similar products available for US market. Moll seems to be a market leader. It was a great investment. The product is a good example of German engineering with precise assembly instructions and well thought through overall design. We bought the moll desk from Empire two years ago and still love it! It exceeded expectations (was everything it claimed it would), had phenomenal step by step set up instructions with amazingly organized parts, and the entire family uses is making it the most utilized piece of furniture in our home! My children have Ehlers-Danlos and hypermobile joints and I can't imagine using any other desk for them! I ordered the moll desk and maximo chair for my six year old. The fine tuning ergonomic adjustments are excellent as he is growing so quickly that I need to adjust the chair and desk every few weeks. Great investment as he loves to do his homework and drawing on this desk. Recommend for any child starting school as it can be used throughout their school years. Shopped around for kid's desk, but nothing came even close to Moll desk. Premium pricing, but if you spread the cost over several years, it's a very good deal. Highly recommended. My Son likes the desk, it adjust perfectly for his height. With the slightly tilted top, it is easier for him to draw. This is my third purchase of Moll Champion Adjustable Desks (two for my nephews and this for my 7 year old daughter). Adjust height/tilting mechanism is very creative and easy to use without any sweat. I see now my daughter spent a lot more time on her desk (reading, art craft, math, homework, etc.) It seems like a little bit expensive. However, it wont be as my initial thought because this desk will last till she graduates her college. My major favorite is height adjustment. I have learnt from teaching my daughter how to ride a bicycle. I was a bit cheap to buy an exact size bicycle for my daughter. Instead I bought a bigger bike which I thought it will last. However, my daughter was very afraid of riding it because it was not for her size and refused to ride for two years. Kids are growing faster. But they need properly sized equipment. This desk provides optimal height at every age of my daughter without spending any extra cost. My second favorite is detail design which considers every aspect of childrens need (such as easer tray, reading book holder, magnetic ruler, and color). My third but not least favorite is their customer service. It is very prompt. I have a broken part when I received it. Just one email sent to the customer service center solved it with expedited shipping and their polite apology. We had been looking a desk that can be adjusted to my 9 years old daughter's height, and at the same time she can use it throughout her college years. This is the most good looking and functional desk we've found so far. The quality and construction of this desk have exceeded my expectation even though the price is kind of expensive for a kid's desk. this desk is wonderful for my son! it is so sleek looking yet so functional. it is definitely an investment, but well worth it because it will take him all through his student years into adulthood. it is a very well thought out design and my child loves it as well. I just ordered the moll desk and maximo chair and it was a great process. The rep was very knowledgeable and even found a promotion for free shipping I could use. I'm looking forward to receiving the desk and chair. champion desk is great but overpriced. Other than the price, it is perfect. we have been very happy with our purchase. And by we I mean my 8 year old son, his tutor and myself - all of whom have different needs. We are homeschooling our son this year and really needed a product that would be comfortable for him to use for long periods of time, that could accommodate his rapidly increasing height, and that would be also be a comfortable place for two people to work together. Before finding the Moll desks I had looked at a range of commercially available children\'s desks, and even adult desks and tabletops. It was incredibly hard to find a desk that actually was useful - as opposed to decorative - and proportioned for a child's size and needs. So I was delighted when I found the Moll desk - this is really an instance of getting what you pay for in terms of quality and design. The Moll desk is made incredibly well, easy to adjust and easy to clean. This desk is literally like having a custom-made piece of furniture and it will continue to be useful as my child gets taller. It is big enough for our son to be able to work by hand with pen and paper, and can easily accommodate a computer without cramping the rest of his work space. It is flexible enough that both an eight year old and his tall tutor can work comfortably together. I didn't want the classroom area in my son's room to look depressingly institutional and this desk with its colorful accents is attractive as well as utilitarian. While the Moll desk is not inexpensive product, it is so well worth the upfront investment. My husband found this desk by chance and then bought it for our 7 year-old boy and I can definetely say that this is the most successful purchase we've made for him up to now. He can't wait to come back from school and do his homeworks. We are trully happy with how convinient it is and the way it looks. The best Christmas present for both our kids because his 2-year-old brother sits next to him on the cubic conteiner. I think the Moll Desk is good for growing children. Above all, the tilted table may be available to make a good seated posture for children. If a variety of colors of Moll Desks is possible, it would be better maintaining and cleaning some dirty part on the desk, like a cherry, brown, soft green. In addition, it would be better if delivery to Korea was possible, the customers in South of Korea would appreciate that. We purchased this desk for our 5year old who is now 6 years old. It has been wonderful. He loves it. 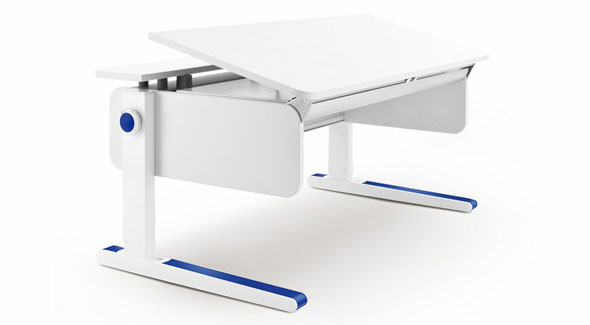 We love the adjustable nature of the desk. Because it can be raised and grow with him we will have this desk for many years to come. We also find it is extremely easy to maintain and clean. We have been extremely happy with the purchase. We bought this desk for my 8 year old son in the hope that he can use it well into the future. The desk is well made, easy assembled and looks great. Obviously the furniture is not the cheapest on the market but I think it is well worth it. Very happy! I purchased the champion desk for my 4-year old son. After a year, we still love it! It fits him well, very good quality, stylish. Will definitely recommend to friends. Champion Desk is a very good investment because its height is adjustable and fits exactly to the height that the children need at different ages, so no need to buy multiple desks as they grow. Its surface is wide and can work comfortably with all the materials they need. In addition, the tilt of the desktop allows them to draw and write supporting their arms and hands in the correct position. Great design and multifunctional! My 9 year old son loves it so much I went on and ordered another one for my 5 year old. Every design and function was meticulously designed and incorporated with sleek design. Worth the $$$! We know this brand for serveral years, we saw the show room in other country, we love the design. After my son 3 years old, I found it in USA, so we bought this desk and chair. You can add different accsessories at any time if you want. Although the price is not cheap, but it can last long time, it's worth to have it. This is an extremely high quality and great looking piece of furniture with brilliant functions. We were worried about our daughter's posture when doing homework and were delighted to find the Moll desk that provides the best ergonomics with its unique tilt position. It's very safe and easy to operate and our daughter absolutely loves her new desk. Also many thanks to Mike Of Moll Desks.com for an excellent service all the way through. 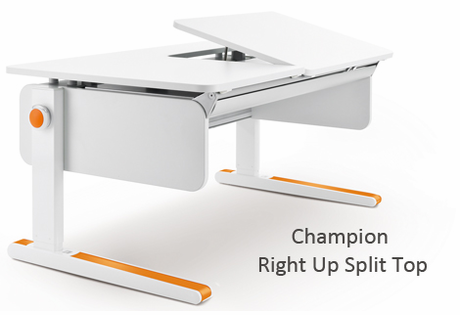 After looking at many ergonomic desks for my child, I chose the Moll Champion Adjustable Desk because it fit my child now and will fit my child for the next fifteen years. This desk is of very high quality and precision manufacturing, it will stand the test of time. I couldn't have asked for more. Thanks Moll! I first saw these desks in Asia and was happy to finally find them in the USA. If you are looking for the BEST kids desk and chair and serious about your kids' education then give them the tools and environment to foster their learning. It pleases me to see my daughters sit at the desk that fits them and they enjoy sitting at it for hours. It's a good long term investment. I could see this desk lasting a few generations. As the mother of a school aged child this desk has been one of my smartest and proudest investments yet. I will never have to purchase another desk for my son again. 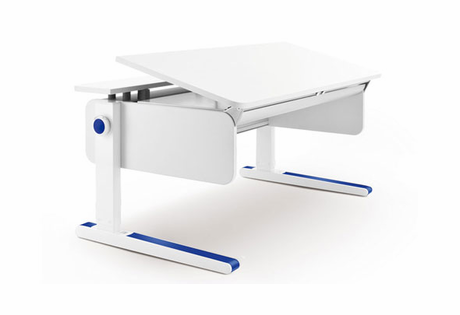 Besides meeting all the needs of being ergonomically correct, easy to adjust as the child grows, incredibly easy to assemble, and very functional and encouraging for homework, this desk also has a nice clean, and very sleek design. Functional and beautiful. I love this desk so much that I even purchased one for myself for my home office. These are not purchases that I will ever regret.